Anyone who doubted that warmblood stallion Hickstead should be ranked among the best showjumping horses the world must now surely be backtracking. 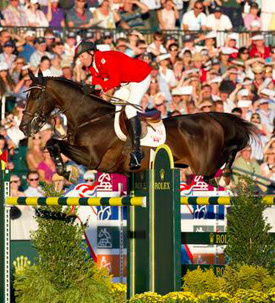 Hickstead, the mount of Canada's Eric Lamaze and the defending Olympic champion, won the title of Best Horse after jumping clear rounds for all four riders in the World Championship decider at the World Equestrian Games in Kentucky on Saturday night. "My horse was great, he jumped well for everyone," said Lamaze of Hickstead, a 14-year-old Dutch Warmblood of holsteiner descent. Hickstead carried winner Philippe Le Jeune, silver medalist Abdullah Al Sharbatly, and bronze medalist Lamaze to clear rounds. Rodrigo Pessoa also rode a clear round on Hickstead. "We already knew that he was the best horse, but now these three other riders know it for themselves," Lamaze said.